What does it mean to you to have the power to change the world? Would you change the world to make it better for you, or better for everyone else? On March 6th, our friends at EA are hosting a free live-streamed event where they are asking you to think about these questions and more as they bring three esteemed speakers into the mix. How do these speakers fit with what EA is announcing? The only way to find out is to tune in. What we can reveal are the first two confirmed speakers. Check them out below. Scott Harrison spent 10 years as an event promoter in New York City before leaving to volunteer on a hospital ship off the coast of Liberia, Africa as a volunteer photojournalist. Returning home to New York City two years later, he founded the non-profit organization charity: water in 2006. Turning his full attention to the global water crisis and the one billion people without clean water to drink, he created public installations and innovative online fundraising platforms to spread international awareness of the issue. In five years, with the help of more than 250,000 donors worldwide, charity: water has raised over $60 million and funded 6,185 water projects in 19 developing nations. Those projects will provide over 2.5 million people with clean, safe drinking water. Scott was recently recognized in Fortune Magazine’s 40 Under 40 list and Forbes’ Impact 30 list. His personal story has been featured in more than 400 media outlets, including ABC’s 20/20 and Nicholas Kristof’s column in the New York Times. 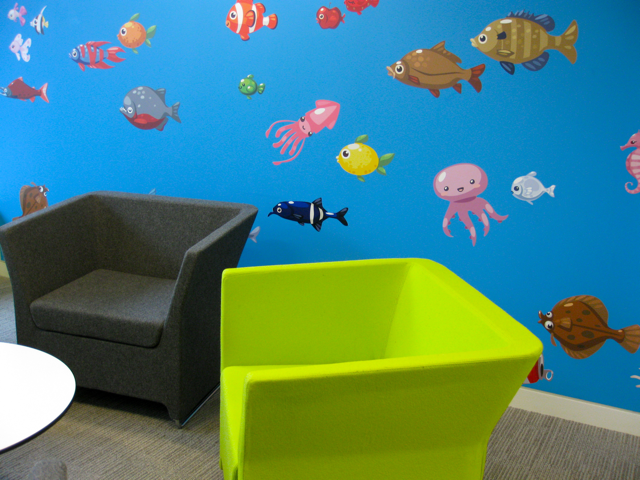 So Playfish fans, what do you think? What does an Academy Award-winning director have in common with the CEO of charity: water, and how does this all fit within EA’s Game Changers Live Stream event? Leave your comments below! Coming in 2014: a Playfish amusement park! That’s right, just twenty minutes north of London, England, we’re building Playfish World, the world’s most spectacular amusement park! The 140-acre amusement park will be divided into four exciting lands: Restaurant City, Pet Society, Country Island – which will feature both My Empire and Country story amusements and rides – and a mystery land, which we can’t reveal right now since it’s based on a game yet to be announced! Playfish World will amuse and delight kids and adults of all ages. In addition to all the thrilling rides and attractions, you’ll be able to meet and interact with costumed versions of all your favorite Playfish game characters as they sing and dance their way through the park. And every hour on the main stage of the Playfish Friends Pavilion, park guests can treat themselves to a zany musical revue starring Pet Society’s lovable Mayor and Maggie, the playful hostess from Restaurant City. Planning to make Playfish World your holiday destination? After a fun-filled day at Playfish World, you’ll be able to relax in your very own luxury suite in one of our very own five star hotels in Hotel City! Here’s a little taste of what to expect in each land! Take a stroll down the real Gourmet Street and find a table at one of the amazing restaurants inspired by actual restaurant designs created by our players! But be careful not to eat too much because you might lose your lunch on the Whirlin’ Waiter Waltzer! Meet the Mayor in his life size house and pick a crazy souvenir from the many bountiful trees in the Pet Society garden! Feel like relaxing? Grab a rod and fish for something rare in the Pet Society lake. Don’t worry, the fish are just props but there are prizes to be won if you can catch a big one! And if getting to England is difficult for you, don’t worry! We have plans to build more parks and we might just open one near you! 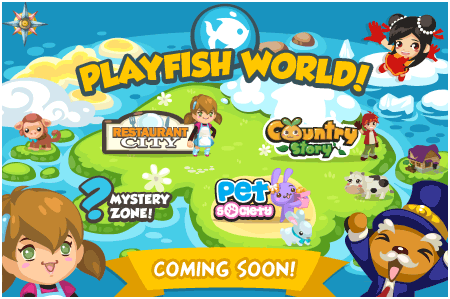 We’ll be back with more details about Playfish World soon! See you in 2014! Players also can donate to Mercy Corps through the “Garden of Hope” in Restaurant City, the “Japan Elite Transfers” in FIFA Superstars, and the “Red Pagoda” in Monopoly Millionaires – and on Thursday through the “Support Japan” bundle in Pet Society. Playfish will donate 100% of the purchase price of these items to Mercy Corps. 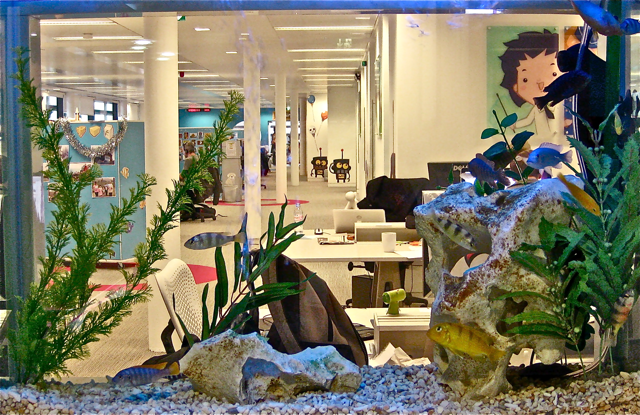 Playfish is Hiring: Come Swim in Our Pond! At Playfish, our mission is to change how the world plays games by creating more social and connected experiences. From our first game “Who Has the Biggest Brain?” to our most recent hit, “Madden NFL Superstars,” more than 250 million Playfish games have been installed and played by millions of people worldwide. It’s no surprise that the social gaming industry is exploding in growth and is here to stay! But, success doesn’t happen over night. The major force behind Playfish’s creative, innovative and technical excellence is the outstanding team of artists, developers, engineers, product managers – the list goes on and on – who collectively create games that are consistently amongst the most acclaimed and popular on Facebook. And, we’re looking for more high energy, intelligent and motivated individuals with a “get it done” attitude to join the Playfish team! If you thrive in positive and creative work environments that encourage ownership and autonomy, visit our job board here for available employment opportunities across all our offices in London, San Francisco, Beijing and Tromso, Norway. But first, check out this fun video to hear first-hand from Playfishers about what it’s like to work at Playfish, the opportunities they’re given, and all the fun they have swimming amongst all the other Fishes in the pond! Click here to see the video! Get the ball rolling during the 2010 FIFA World Cup™ and check out EA SPORTS FIFA Superstars, only on Facebook. Here’s an exclusive interview with Playfish’s Henrique Olifiers, the producer of the first official FIFA football social game. Welcome, Henrique. Tell us about yourself. Hi, as producer of this exciting game, I’m responsible for coordinating the original concept for FIFA Superstars. 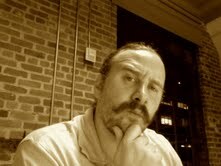 I work with a very talented team and determine what each person’s role is. If you like, think of me like a movie director. What experience do you have ‘directing’ games? Well, I’ve been doing this for about 10 years and I started working on games 20 years ago, back on the ZX Spectrum computer, which some of you may or may not remember. So yeah, I bring some good experience to FIFA Superstars. What about experience working on football games? I worked on two football titles prior to FIFA Superstars. Both posed similar challenges: finding the delicate balance between providing the player with an abundance of information and features, and making it all accessible and manageable. Give us the score – what is FIFA Superstars? It’s a really fun game to start with if you’ve never played a football game. It’s been created with the novice in mind. You start by building and managing your own team around the players you like. You’ll be able to play your friends and others around the world or face the virtual version of real world teams. Can you imagine scoring 5-nil against Man U? Or bragging about scoring a 3-nil victory against a friend or a random FIFA Superstars player? I think that’s pretty cool. What inspired the look of FIFA Superstars? What kind of game is FIFA Superstars? All three: it’s a simulation, a fantasy and a managing game rolled into one sweet package available from anywhere you can log onto Facebook. It’s really unlike any football game that’s come before. I’m really proud of that. However, I find myself frustrated that I couldn’t put everything into the game from the day of release. But the really great thing about FIFA Superstars – and social games in general – is that we will be adding a lot of really cool features as the game grows, so I’m really looking forward to its evolution. How likely is it that everyone will pick the same players for their teams? It’s very unlikely that you will have the same team as someone else; FIFA Superstars has more than 15,000 football players from which to choose. They range from players who have not played for a long time to living legends virtually everyone knows of. As you start winning matches you can afford to hire more experienced players for your FIFA Superstars team. What was the most challenging aspect of bringing FIFA Superstars to life? I’d say the usability of the game – that is, how easy or difficult it is to understand what you should do with the information presented to you in the game. As there is a simulation aspect to FIFA Superstars there is a ton of information involved in bringing that to the gamer. It was about looking at how to consolidate all of that into easy and relevant statistics per player on your team. The players are definitely my favourite aspect. I’m a massive football fan – I scour the statistics of each player like a hawk before making my choices for my team. Each one of the stats used for a player – be that shooting, pace, energy – all goes into making a unique player. And I’ve got to have the best. The best, huh? What did you call your team? Zombies – it was a total no brainer – no pun intended! It’s in homage to the team of people I work with at Playfish, the Zombiefish team. You didn’t name your team after your favorite football team? My favorite real-world football team is the Brazilian Flamengo FC but the Zombies definitely come first, without a doubt. The entire Zombiefish team was just outstanding in pulling together, especially the last month of development, which was a big stretch. I’ll always be their biggest fan. How are you feeling now that the FIFA Superstars is out? Super excited. We already broke the first day record for number of players to start playing the game, beating both My Empire and Hotel City – both of which are currently very popular. That’s a very positive sign. What new features will you be bringing out and when? What you’re seeing is about 20% of the game that we’ve already planned out. There’s a lot for us to add. For example, expanding the stadium styles and setting up more training facilities. These will have a bigger impact on the game as more people play. Essentially, if you want it, it’s more than likely we’re already working on it. This week we take another exclusive look at Hotel City. We spent a few minutes with Stian Hansen, the game’s producer, to find out what it was like to bring Playfish’s latest game to life. Hi Stian. Let’s start with your role in Hotel City. Is it fair to call you the “proprietor”? Hi everyone. Yes, I suppose it would be fair to call me that. But my official title at Playfish is producer. I’m responsible for all aspects of Hotel City, from the concept to getting the game launched, and ensuring the game is packed with all the fun and social features our players expect. 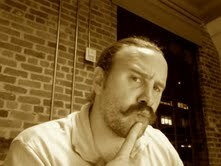 In my role I work with a wide range of people at Playfish, which is really cool. How did the idea for Hotel City come about? 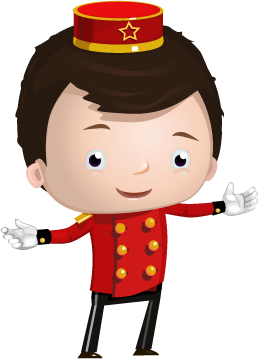 Since everyone at Playfish is involved in making our games, the hotel management theme came up quite a few times. After putting the idea down on paper and getting some feedback, it really felt like the beginnings of a fun and very social game. When players see the name of the game I believe they’ll understand right away what this game is about, namely building and running your own hotel. We’ve managed to make it very easy to get in to. In fact, my 4 year old son got to play it during development and he absolutely loves it! Hotel City is about building and decorating your very own hotel. You’ll need employees, so you hire your friends. Your guests want to enjoy their stay at your hotel, so you can build them fun rooms that include a swimming pool, a restaurant, arcade, and many other fun things. It’s entirely up to you! I can’t wait to see what cool hotels are created by our players. That sounds fun! How about a cool Hotel City tip? I would suggest not spending all your money on just one thing. Hotel guests can be pretty demanding, so I recommend listening to them and the watching the speech bubbles that pop up. Those will give you plenty of direction. What’s been the most challenging aspect of creating Hotel City? Narrowing down the amount of features in the game, for sure. When people play the game they’re inspired and come up with all these fun things they’d like to see in the game. Filtering out the best ideas and deciding what goes into the first version of the game is tricky and you don’t get a second chance of doing that once the game is live. Of course, we’ll keep adding things, but we wanted to give players some really great features to play with in their first session so that they can start having fun straight away. What’s been the most fun aspect of creating Hotel City? Honestly, the whole thing has been one big joyride, even to watch the game develop. The Hotel City team is so full of energy and good spirits and that shows in the game. I keep hearing how Hotel City is the Big Buzz in our other studios right now, and that really is a great inspiration to me and the team. Will you be adding any new features to Hotel City in the next few weeks and months? Now that the game is live, we’ll dive right into adding more features. We’ve got small and big features planned – they all go very naturally with the hotel theme of the game. There will be something for those who play the game for the decorating fun and something for those who enjoy the more strategic managing and building aspects. Keep your eyes on the fan page for updates! During development I came up with a new name for every time I played the game, but one day my creativity ran out and I got stuck with the name from the day before. It’s simply “Asda Hotel”. Who have you hired as staff in your hotel? That’s the fun thing about Hotel City – it’s a small twist on the concept of hiring friends in Restaurant City. You’re not really in control of who gets to work at your hotel. You post up an ad on your wall letting your friends know that you are hiring, and the first of your friends to click the link gets the job! It’s going to be a race to get there first because, as a bonus, your friends will receive coins for working at your hotel and can collect bags of coins from you every time you run a shift. 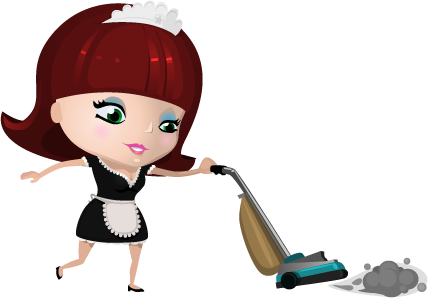 There’s a bonus for you when your friends work at your hotel, too, as temporary staff are more expensive per shift, whereas your friends are far cheaper to employ! Yes – a big thank you to all of our fans who have already started playing Hotel City! Don’t forget to check out our fan page and the forums for the latest updates from Hotel City. We love hearing your suggestions so please keep them coming in! A couple of weeks ago Ken Ward provided some insight about what it’s like to work for Playfish and, in particular, our London studio. This week we’re following up with a conversation with Dan Fiden, who joined Playfish as General Manager of the newly opened San Francisco development studio. For readers attending the Game Developers Conference in San Francisco next week, Dan will be speaking on panels at the Flash Gaming Summit, Monday, March 8, and VCON on Wednesday, March 10. Stop by and say hello to Dan if you’re there! Hi Dan, how’re you doing? I’m good, thanks! I’ve just got back from lunch, actually. Had a really great sandwich from a nice Italian place down the street. Awesome. So would you let our readers know what do you do at the San Francisco studio? I’m managing the studio in San Francisco and taking care of all of our staff’s needs as we expand our offices here, but I’m also doing a little bit of everything, really. We’re expanding fast so I’m interviewing lots of candidates for studio roles here – engineers, artists, producers, product managers – all of whom will be creating social games. I’m even doing a bit of games design in the background. 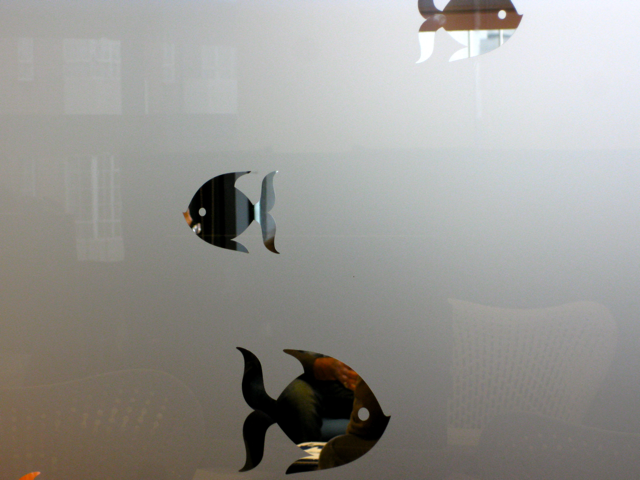 If you’re interested in working for Playfish, check out our job postings. Talk about variety – sounds like you’re a jack of all trades! It’s fun. I look forward to getting into the office every day. The location is super cool down on the waterfront near the San Francisco bay bridge. It’s one big open loft space – everyone’s always around. 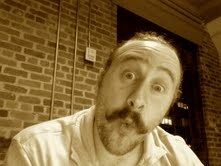 We take plenty of breaks to goof around and crank up the music, chill out in between lots of hard work. 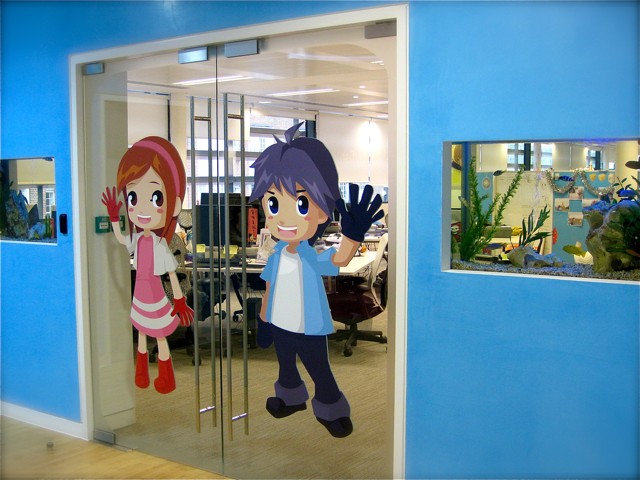 I’ve been to Playfish’s London studio too, and it’s the same there. Here, of course, at lunch, we get to walk around the bay. One of the nice things about being at Playfish is the positive atmosphere that is so collaborative; there’s a strong feeling of everyone working toward the same goal. Everyone has a voice in the creation of games too. What excites you the most about getting into the office each day? We’re just getting started on building some amazing game teams. We’ve already got an enormous amount to talent here. There’s lots of brainstorming and ideas coming from all around the studio. That’s one of my favorite aspects and it’s a really fun part of the game creation process and we encourage everyone to pitch in. We just throw ideas on to the whiteboard and imagine how various ideas would work in a game. You mentioned you’re interviewing people. What kind of person are you looking to hire? Above all, they’ve gotta be passionate about games, about making games and making really good games. They’ve really got to love games to do that well – it’s the single greatest criteria in my mind. 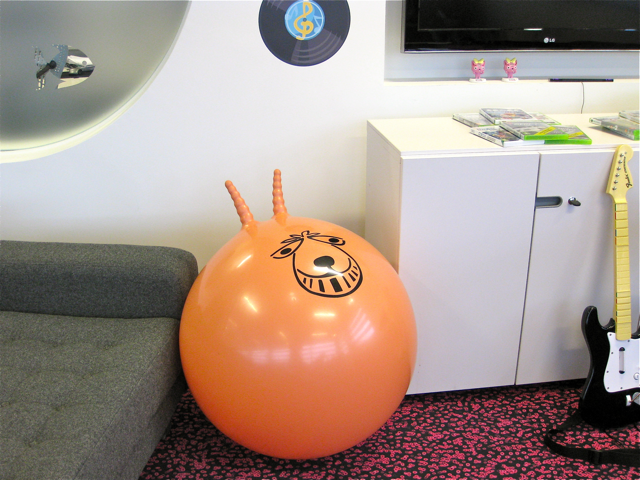 It’s important that the people we hire enjoy the creative and collaborative environment we have here. The creative process is social – just like our games. What’s your kind of game? This is going to sound corny, but honestly, social games – the kind of game where the crowd gets involved and people are shouting to their friends about it in the background. Games people want to huddle around and poke their nose in. Those bring about great memories and are so much fun. That’s what Playfish games are like, too. What final thoughts would you like to leave us with? Just a great big thanks to our players! Keep talking to us through the forums and on our fan pages. 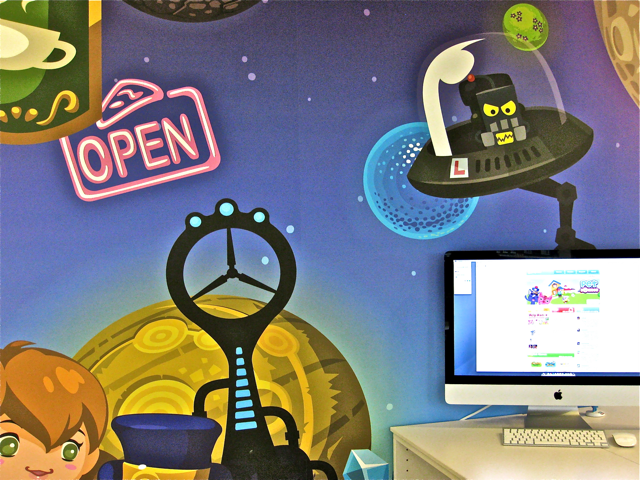 We enjoy your feedback and love integrating your ideas into our games whenever possible. We hope you continue to enjoy Playfish games!